Αναδημοσίευση από το διαδίκτυο για τα γεγονότα σε ένα κέντρο κράτησης στην Αυστραλία, το αρχικό άρθρο εδώ. Immigration Minister Scott Morrison has confirmed several asylum seekers were injured when staff shut down a week-long protest at the Christmas Island detention centre yesterday. 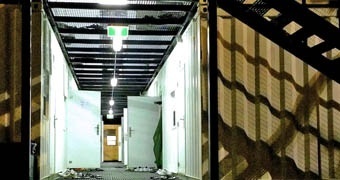 The ABC understands around 70 male detainees, who had been protesting to mark 100 days since the death of Iranian asylum seeker Reza Berati on Manus Island, were removed by specially trained staff and taken to a high-security facility known as ‘Red Block’. Mr Morrison has told Parliament some detainees became aggressive and had to be restrained after detention centre operator Serco called in an emergency response team (ERT) and asked all asylum seekers to return to their compound. “The majority of detainees were compliant however I am advised a small number exhibited non-compliant behaviour,” he said. “The Serco ERT continued negotiations with those detainees who were refusing to comply. Reports to me suggest some detainees became aggressive and were subsequently restrained and moved [from the area]. “I’m advised that two detainees suffered minor injuries arising from non-compliant behaviour and were treated onsite,” he said. “A further four were taken to hospital for a range of injuries including suspected sprains or broken bones. The ABC has been contacted by a Christmas Island resident who witnessed yesterday’s events. The person, who wanted to remain anonymous, said the protests had been peaceful and specially-trained staff removed some asylum seekers yesterday. “One-by-one the protesters were removed from the group,” the resident said. “Most got up and walked away voluntarily but some didn’t. The resident said a nurse on the island had reported “several cases of self-harm among the protesters, mainly cuts to arms and chest”. Greens Senator Sarah Hanson-Young says she has been contacted by people who work inside the centre who are “very concerned there was an over-reaction” to the protest. “There are reports that violent clashes have occurred that have left asylum seekers terribly injured,” she said. The Australian Federal Police have told the ABC they were not involved in ending the protest. Serco has been sought for comment. The protest marked 100 days since the death of Iranian man Reza Berati during a riot at the detention centre on Manus Island. Mr Berati, 23, died during riots which saw another 60 asylum seekers injured, including one man who lost his right eye and another who was shot. An eyewitness has told investigators a PNG national employed by the Salvation Army led the attack on Mr Berati. The Salvation Army is acknowledging a former staff member is alleged to have led the attack on Mr Berati and says it will cooperate with all inquiries. This entry was posted in ΝΕΑ ΑΠΟ ΤΟ ΜΕΤΩΠΟ and tagged ΑΥΣΤΡΑΛΙΑ, ΚΑΤΑΣΤΟΛΗ, ΚΡΑΤΟΣ, ΜΕΤΑΝΑΣΤΕΣ on June 4, 2014 by simeioseis.